Just wanted to thank everyone for your prayers for my dear friends Rex and Judy. Rex got to come home earlier than expected. He has now almost fully recovered from the surgery. The doctor called today after reviewing the tumors and seemed really hopeful that everything was going to be fine. They still have to send off for a biopsy, but he kept reassurring Judy that everything looked really good! God is so big!! Not much to report on this week except that Nathan went in for his 9 month check up. 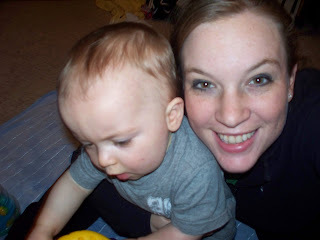 I can't believe he is already 9 months.The time really does go by SO fast. We started the day visiting Rex and Judy in the hospital. It was great to see them, and we even got to take a walk around the hospital with them! We then headed to the doctor. His check up was great. He weighed in at 21 lbs 2 oz, and was 28.5 inches long. 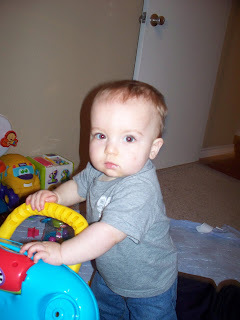 He was in the 54th perrcentile for weight, and 56th percentile for height. 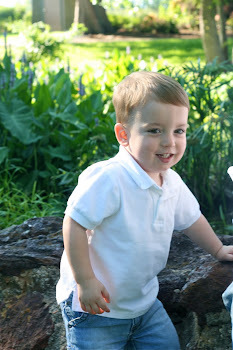 He is just so special to me! I love watching him grow. After the check up, we met Aunt Laura for lunch. It was so great to see her and visit with her. We had a great time at lunch and Nathan enjoyed eating with his great aunt laura! We then made a quick trip to a couple of stores and then headed back for basketball practice. It was a great day! Nathan and Matthew headed to the deer lease around lunch time today. This is Nathan's first deer season. He can't go sit in the stands with his daddy ( although his dad told him that it wouldn't be long before he would take him) but he can wear some camo and hang out in the cabin. I can't wait to go down there tomorrow and see my guys. I will have more pictures to post after this weekend (hopefully of big bucks!) . 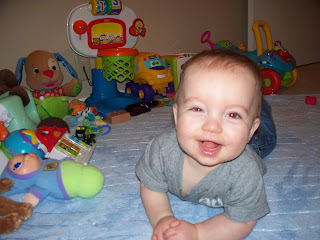 I couldn't sign off without posting a few pictures of my little 9 month old sweetie playing. So here goes. 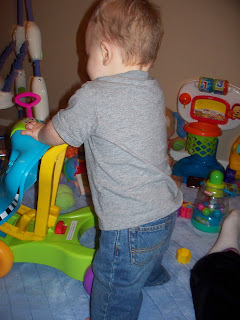 He loves to stand up on his own now. I'm a big boy mom!